What's in a (Social Media) Job Title? Social media job titles can be confusing. What I found out about the types of roles involved today. A couple of weeks ago, my colleague Jeppe in our Customer Success team made a casual comment to me about the range of job titles his customers have. He sent me a list – it was indeed impressively varied, ranging from titles such as “Cross Channel Team Leader” to “Lead Business Developer” and, of course, “Social Media Manager”. Jeppe works with customers on helping them get the most out of our social media management platform and optimizing their organization’s social media channels, so it’s pretty niche. Or is it? It got me thinking. Here at Falcon, we’re seeing more and more interest in our platform from professionals outside of the marketing and PR department – the traditional “owners” of social media for business. Taking a scan of our customer list, you’ll find HR Managers, Project Managers, Business Development Executives, Customer Service Team Leaders, as well as all the marketing and comms roles we’re traditionally used to seeing. I crunched our customer data to see if any patterns emerged looking at titles with a particular word included, for example “marketing”, “community” or “recruitment”. Here come the results. I’ll be the first to admit that this isn’t an exact science. A cross channel manager wouldn’t have appeared in my results, for example, and neither would a project manager whose “project” might include anything from social media management to PR. However, I think it’s pretty telling. Whilst “marketing”, “social” and “PR & comms” roles account for most of our customer base, we’re seeing a marked and consistent presence of sales, community management, recruitment, leadership and customer-focussed professionals. They perhaps haven’t yet been labelled as working with social in their job title (I’m yet to see a Head of Social Selling) but social is certainly defined in their job description and KPIs. Now we’re seeing that social media is a company-wide concern. The people we talk to are interested in learning about leveraging social for selling, carrying out customer service within social media, how they can use social media for recruitment and for improving internal communications and company buy-in from employees. 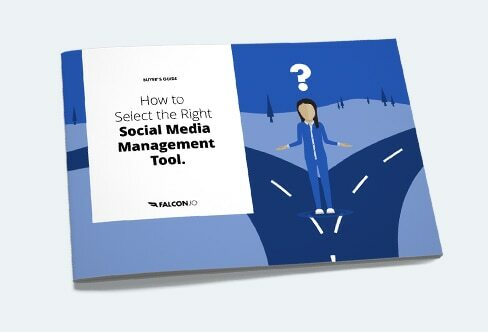 CEOs and leaders are working with companies like Falcon to identify opportunities for tapping into employee advocacy on social media, in order to boost organic reach, raise brand awareness and accomplish a lot of other things. This is about you now – whatever the role in your company. So what’s in those social media job titles? Friends and family have made fun of my own in the past – I’ve been an Audience Engagement Officer, Communications Officer, Customer Marketing Specialist, Digital Manager – and that’s just for starters. The truth is, we’re all working this social media landscape out – what can be achieved and what human resources need to go into making that happen. It’s an iterative process. We’ve been creative; we’ve made up job titles; we’ve even invented and re-purposed whole new words. I see no sign of that stopping. If I had to predict what our customer job title data would look like in a year, I’d bet that we’d have a very different picture in front of us. I’d expect to see more HR titles, engaged in delivering on social recruitment and employee advocacy. We’ll also be working with more customer service roles, given the rise in expectation of customers to have their problems answered on social. We might even see “social” creeping into new roles – “Social recruitment specialist”, anyone? Honestly, the title is not the issue in my view. The challenge is this – how do we best break down internal silos to really make the most of the opportunities afforded by social? I’m looking forward to seeing that play out.